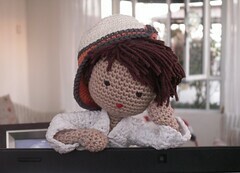 I have enjoyed your photography with your little crochet guy this year. Thanks for the smiles. Happy New Year to you. Happy New Year to you too from Pomi and myself and thank you for kind words. I always enjoy your photos with the little fellow . They have a very endearing whimsy about them and this one is no exception. Happy New Year. Well Happy new year to the pomi and his loving partner, kiss to the favorites, Hk’s you have done such an amazing photography with your younger loving fellow.